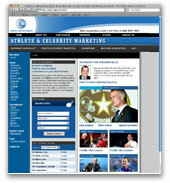 At Premiere Athlete & Celebrity, we connect corporations worldwide with the biggest names and personalities in sports and entertainment. With access to thousands of athletes, coaches, and entertainers our company specializes in securing and booking the perfect personality based on your company's specific needs. As an experienced market leader, we have successfully brought the greatest athletes, coaches, and celebrities in sports and entertainment to companies around the globe and we understand the importance of service, credibility, and detail.